MONTREAL - Pierre Duhaime, the former chief executive of Canada's biggest engineering firm, has been granted permission to travel within the country pending a criminal trial on fraud charges. 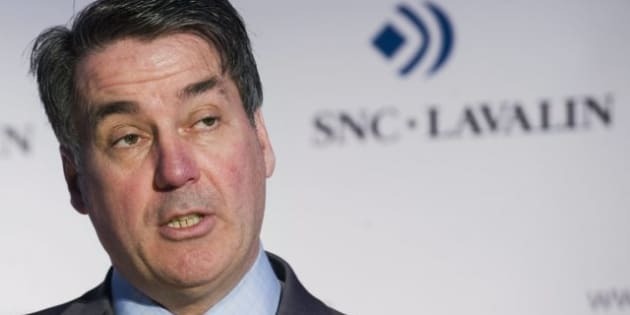 Duhaime, once the head of engineering powerhouse SNC-Lavalin (TSX:SNC), was formally charged with fraud on Monday. He was not required to be present in the courtroom, and his lawyer, Michel Massicotte, pleaded not guilty on his behalf. A change was made to conditions surrounding Duhaime's release. Initially, he was forbidden from leaving Quebec. The Crown has now agreed he can travel elsewhere in Canada — but not beyond its borders. "We asked that his conditions permit him to go across Canada for purposes of work, to give him better opportunities and it was considered to be a reasonable alternative," Massicotte said outside the courtroom. Duhaime faces charges of fraud, conspiracy to commit fraud and issuing false documents. The next date in the case has been set for May 23 when Massicotte is expected to receive more evidence. Duhaime and another former top executive, Riadh Ben Aissa, face charges stemming from a contract involving the building of the multibillion-dollar McGill University Health Centre. The charge sheet alleges the infractions took place between April 30, 2009, and Aug. 31, 2011. Duhaime was relieved of his duties in March 2012 after an independent review showed he signed off on $56 million in payments to undisclosed agents. The company called his abrupt departure a "retirement." Duhaime was arrested last November by Quebec's anti-corruption squad and released on a promise to appear on Monday. Ben Aissa was arrested in April 2012 in Switzerland and is awaiting a trial there on charges relating to alleged corruption, fraud and money-laundering in North Africa. Crown prosecutor Marie-Helene Giroux said it's unclear when SNC's former head of construction will be returned to Canada. "There is an extradition request to have him sent back to Canada," she said. A recently unsealed affidavit from the RCMP alleges Ben Aissa paid the son of late Libyan dictator Moammar Gadhafi $160 million in kickbacks to obtain access to lucrative contracts in that country. The document indicated the bribes included a yacht for Saadi Gadhafi. The affidavit, which has since been resealed, also implicated Aissa and former SNC-Lavalin executive Stephane Roy in an alleged effort to smuggle Gadhafi's son and his family to Mexico as the Libyan regime was falling in 2011. The RCMP raided SNC-Lavalin offices a number of times in 2012 and Duhaime, Roy and Ben Aissa all lost their jobs within several weeks of each other. The company is one of the top engineering and construction groups in the world and is currently working in some 100 countries. SNC-Lavalin has taken a number of steps to improve its governance and requirement that employees adopt ethical behaviour. It has also co-operated with the various investigations underway. Even though Duhaime's departure from the company was classified as a "retirement," Massicotte said his client is currently not working. He wouldn't say if he had any job prospects. A $5-million payout granted to him by SNC-Lavalin when he stepped down was suspended last December. While no allegations have been proven against Duhaime in court, the payments were suspended in light of the criminal charges. There was a suggestion by the company it might not have been aware of certain facts at the time of Duhaime's departure.